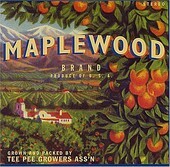 Maplewood's self-titled full-length is warm, vibrant record reminiscent of Southern California. Thus, incorporating a lot of Southern California pop flavor into their country-rock hybrid, Maplewood delivers the type of record that can only be inspired by the California sun, the Byrds, and a love of anything with a good pop melody. This is what you may have gotten if Nashville were in California, a bright, optimistic, uplifting record rooted in roots, but not afraid to grow out and deliver bursting melodies and soaring hooks. Its inviting, relaxing, but is filled with energy as well. I'll give it a B.